New Airline Arrives - Southend Airport saw in the New Year with a new airline moving in, British Island Airways. The firm took over operations from British Air Ferries. A Memorable Nig ht at Roots - On 10th January 1979 Southend United recorded its highest ever gate of 31,033 for a game against Liverpool for the FA Cup Third Round. The Shrimpers held the Scousers 0-0. The game was hampered by horrendous weather conditions causing the long awaited fixture to be regularly cancelled. However the Red Devils brought a full squad to Roots Hall, including Graeme Souness, Phil Neal all under the stweardship of the mighty Bob Paisley. The game went to Anfield for the replay, with Liverpool finally winning 3-0. Essex House Occupied - One of the tallest office blocks near the centre of town, Essex House finally found an occupier this year, two year's after completion. To the rescue came credit card company Access to take over this huge block that looks down on the junction between Southchurch Road and Southchurch Avenue. Access has already established its headqaurters in Priory Crescent. The Famous Potatoes Formed - One of Southend's noted lo cal bands. The Famous Potatoes were formed in 1979, at the height of the Punk scene. Well known locally for their 'Soil Music' and rated as one of the best Barn Dance acts in the country. A regular key act at Leigh Folk Festival and across Southend pubs. Website. A Year of Strikes - 1979 will be remembered by many for the number of strikes endureed by all, whether caused through the binmen or any other nationalised industry. Rubbish bags piled up outside the Eastern Avenue rubbish depot as residents become tired of rotting food building up outside their properties. High Speed Train to Scotland - Southend Central station hosted British Rail's newest high speed train the Inter City125 on Saturday 31st March. Enabling Southenders to spend the day in Edinburgh. The train picked up at stations along the coastal route before heading north providing passengers a 3 hour sight-seeing opportunity before heading south again. 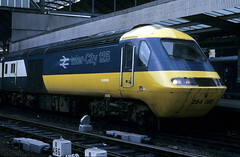 The 856 mile return journey would cost this day £12 or £15 first class. Rubble All Around - The old tram sheds (some 78 years old) in London Road along with the Eastern Electricity Headquarters were reduced to rubble in 1979, in there place was planned one of the largest Texas DIY stores in the country, planning to be open the following year. McAdden Dies - Southend East's MP died while in office in 1979. Stephen McAdden had served the seat since 1950 as a conservative. His death led to the election of Teddy Taylor. The Last Carvair - An aircraft that became a symbol for Southend Airport, the Carvair, made a final farewell in 1979 as the last aircraft of its kind left the airport. The Carvair had served its time, for some 22 years, and was originally desinged for purpose by the famous airline entrepreneur Freddie Laker. It became famous as a car ferry to Europe, but also more generally as a freight craft. The last plane, called Plain Jane. of its type at the airport was finally sold to the US, Gone due to the expensive running costs, of this petrol driven machine.